The Arian heresy and controversy was raging. (Arians didn’t want to acknowledge Christ as consubstantial with the Father: sound familiar?) Thus, Liberius called a for a Synod in Rome, but the Synod came to nothing. Liberius then made an appeal to Constantius to call a council to be held at Aquileia. Sometimes anti-Catholics will fling Liberius in our faces as an example of how the Pope cannot be thought to teach infallibly. SSPXers often invoke him and Athanasius as a way of justifying their disobedience. Liberius, however, is a complex figure in difficult times and much of the “story” of his “fall” in weakness is not properly grasped. After Constantius, the infamous Julian adopted a policy of toleration. Pope Liberius issued a letter to the bishops of Italy in 362 and a letter of reply to the bishops of the East in 366 which both affirmed the faith of the Council of Nicaea. 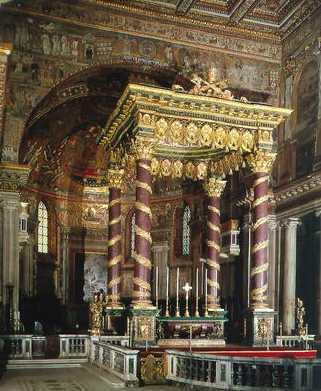 This entry was posted in Liturgy Science Theatre 3000 and tagged Liberian Basilica, Pope Liberius, St. Mary Major. Bookmark the permalink. One point being that a Pope who celebrates the Council of Ephesus and calls Mary “Mother of God” or “Theotokos” (God-bearer) is not an Arian pope in any way. Thanks for posting about my birthday/nameday feast! Happy name day to all the Nieves out there! Timely article! Thank you! Some weeks ago I was having a discussion with an SSPXer who indeed brought up the situation of Pope Liberius as a defense. Liberius, however, is a complex figure in difficult times and much of the “story” of his “fall” in weakness is not properly grasped. Indeed, it sounds as if the neo-protestants may be grasping Liberius’ case from the wrong end! One cannot but be tempted to wonder how much similar duress, or at least strong persuasion, may have been applied to Popes in more recent times. The consideration, it seems to me, invites one to give the benefit of the doubt with respect to some jarring events of the Modernist era — such as, to cite one case among scores, the heavy-handed construction of the Novus Ordo and its imposition upon the faithful — regarding which a less, shall we say, charitable spirit might be too quick to attribute papal wickedness. Appropos of nothing, the TOP headline on drudge report right now hits my funny bone as worthy of “Eye of the Tiber”: POPE INVITES OPRAH TO VATICAN . Not withstanding causing a laugh, it’s a wonderful idea. Apparently the story behind the headline is that the Pope is inviting a select list of Hollywood types to the Vatican for a meeting about improving the Church’s portrayal in the media. Which is an even better idea. Maybe this is part of the same thought process that led Pope Francis to make Fr Robert Barron “bishop of Hollywood” (as I think Whispers from the Loggia put it).